Two Sisters Spa - Surprise mermaid necklace inside - Truly a gift within a gift! As the bath bomb fizzes out, a surprise kids mermaid necklace is revealed. Luxurious bubble bath - Our original propriety formula one-ups traditional bath bombs by also creating a bubble bath. Colorful scented water - A fun bath experience with Fruit-Loops-scented teal water! Ingredients: sodium bicarbonate, olive oil, Epsom salts, witch hazel, water-based colorant, fragrance oils, citric acid, and colored sugar. It is teal with shimmery teal sprinkles on top and smells like fruit loops. Skin-nourishing - Packed with olive oil to leave you skin super-soft! As it dissolves in the tub, a surprise Mermaid Necklace will be revealed inside. Mermaid BUBBLE Bath Bomb with Surprise Necklace Inside for Girls by Two Sisters Spa, Best Birthday Gift Idea, Large Scented Spa Fizzy, Fun Color, Lush Scent, Vegan, Hand-made in USA Mermaid Surprise - Mermaid colors vary - see pictures for examples This is truly an enchanting bath experience for the little mermaid in your life. All of our bath bombs will leave your skin super-soft, and their scents will linger on your skin and in your room long after your bath. Perfect gift - need a gift for a child or teen who "has everything?" we've got you covered. This mermaid-inspired Bath Bomb is the perfect bath-time treat for the little mermaid-lover in your life. When placed in the tub, the bath bomb will fizz and create a fruit loop-scented, teal bath experience. Great for Christmas, or any other Holiday. Two Sisters Spa - You will love how your kiddo smells after each bath. Vibrantly colorful Water that won't stain your tub. The most hydrating to moisturize dry sensitive skin. Gorgeous packaging designed for gift giving and to preserve freshness. Handcrafted with natural Ingredients in Minnesota, USAHandmade with Love. Designed and hand made by our team of flex-working moms in our home state of Minnesota using our own proprietary recipe. Natural kid-safe Ingredients sourced from the USA. Don't settle for anything smaller. The best Scents. Unicorn bubble bath bomb in gift box with surprises necklace inside Releases Grape Fragrance, Purple Color, and Bubbles into your bath water as it dissolvesHigh Quality Necklace is hidden in each bath bomb so he'll remember this gift long after her tub time. Girls Unicorn BUBBLE Bath Bomb with Surprise Necklace Inside by Two Sisters Spa, Best Birthday Gift Idea, Large Scented Spa Fizzy, Fun Color, Lush Scent, Kid Safe, Vegan, Hand-made in USA - See and feel the difference of our Bubble BombsNo more fighting at Bath Time! Bath time has never been so much fun and exciting. Our bath bombs change kiddos from saying "no way" to "every day" for bath time. Actually creates a bubble Bath! Our proprietary recipe was designed for bath bomb fans that also love a bubble bath. Fun fact! most other bath bombs don't create a bubble bathBest Surprises. Compare our variety and quality to others and see the difference. Large Size. Two Sisters Spa - Great for christmas, Easter, Birthdays, or any other Holiday. The best bath experience for superhero fans! when placed in the tub, our superhero bath bomb will fizz, and create a berry-scented, bubble, blue bath experience. This superhero-inspired Bath Bomb is the perfect bath-time treat for the little superhero in your life. Skin-nourishing - Packed with olive oil to leave you skin super-soft! Surprise unicorn necklace inside - Truly a gift within a gift! As the bath bomb fizzes out, a surprise rainbow unicorn necklace is revealed inside. Luxurious bubble bath - Our original propriety formula one-ups traditional bath bombs by also creating a bubble bath. Superhero BUBBLE Bath Bomb with Surprise Toy Minifigure Inside by Two Sisters Spa, Best Boys Girls Gift Idea, Large Scented Spa Fizzy, Fun Color, Lush Scent, Natural, Kid Safe, Vegan, Hand-made in USA - Colorful scented water - A fun bath experience with Grape-scented purple water! Great for christmas, easter, Birthdays, Valentine's Day, Halloween, or any other Holiday. Fun party favor: be the "hero" of your child's birthday party - kids will love their superhero bath bombs as their mementos from your Superhero Party. What our customers are say about our bath bombs: "Love, Love! ", Love, "A gift within a gift", "completely surpassed our expectations", "Worth the price". When placed in the tub, colorful, the bath bomb will fizz and create a scented, bubbly bath experience. Our surprise bubble bath bombs are a gift within a gift - when the bath bomb fizzes out, Valentine's Day, Halloween, they have a fun piece of jewelry to remember what is sure to be one of their favorite gifts. Minifigures vary by bath bomb - see pictures for examples and collect all 6! This bath bomb weighs 4-5 oz and is about the size of a tennis ball. Two Sisters Spa - This bath bomb weighs 4-5 oz and is about the size of a tennis ball. When placed in the tub, the bath bomb will fizz and create a cake-scented, bubbly pink bath experience. It is pink with rainbow colored sprinkles on top and smells like birthday cake. All of our bath bombs will leave your skin super-soft, and their scents will linger on your skin and in your room long after your bath. Surprise unicorn necklace inside - Truly a gift within a gift! As the bath bomb fizzes out, a surprise rainbow unicorn necklace is revealed inside. Luxurious bubble bath - Our original propriety formula one-ups traditional bath bombs by also creating a bubble bath. Colorful scented water - A fun bath experience with Grape-scented purple water! 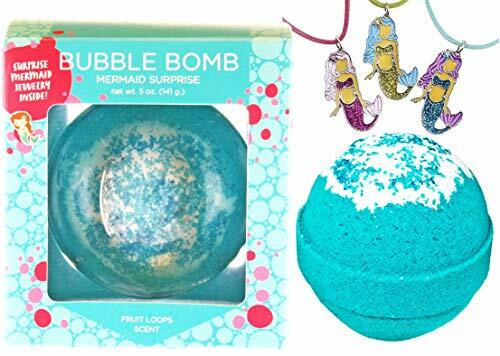 Birthday Surprise BUBBLE Bath Bomb with Surprise Girls Necklace Inside by Two Sisters Spa, Best Gift Idea, Large Scented Spa Fizzy, Fun Color, Lush Scent, Kid Safe, Vegan, Hand-made in USA - Surprise necklace inside - truly a gift within a gift! As the bath bomb fizzes out, a surprise necklace is revealed inside. Luxurious bubble bath - Our propriety formula one-ups traditional bath bombs by also creating a bubble bath. Colorful scented water - A fun bath experience with Cake-scented pink water!
. Skin-nourishing - Packed with olive oil to leave you skin super-soft! Skin-nourishing - Packed with olive oil to leave you skin super-soft! As it dissolves in the tub, a surprise necklace will be revealed inside. Two Sisters Spa - As it dissolves in the tub, a surprise Superhero Minifigure will be revealed inside. The best surprises: each superhero bath bomb has a surprise Superhero Minifigure inside - Spiderman, Thor, Captain America, Superman, Batman, or Hulk. Collect all 6! Perfect gift idea: the gift that keeps on giving - they'll remember this special gift every time they play with their minifigures. Surprise necklace inside - truly a gift within a gift! As the bath bomb fizzes out, a surprise necklace is revealed inside. Luxurious bubble bath - Our propriety formula one-ups traditional bath bombs by also creating a bubble bath. Colorful scented water - A fun bath experience with Cake-scented pink water! Kitty BUBBLE Bath Bomb with Surprise Girls Cat Necklace Inside by Two Sisters Spa, Best Birthday Gift Idea, Large Scented Spa Fizzy, Fun Color, Lush Scent, Kid Safe, Vegan, Hand-made in USA - The perfect gift for Cat lovers. Luxurious bubble bath - Our original propriety recipe one-ups traditional bath bombs by also creating a bubble bath. Colorful scented water - A fun bath experience with Cotton Candy-scented pink and blue water! Our surprise bubble bath bombs are a gift within a gift - when the bath bomb fizzes out, Valentine's Day, Halloween, they have a fun piece of jewelry to remember what is sure to be one of their favorite gifts.
. When placed in the tub, the bath bomb will fizz and create a cotton candy-scented, pink and blue bath experience. Purr-fect" gift - need a gift for a child or teen who "has everything?" we've got you covered. Dino Fizz Hatching Tyrannosaurus Egg Bath Fizzy - 2.2 oz. Two Sisters Spa - Our surprise bubble bath bombs are a gift within a gift - when the bath bomb fizzes out, Birthdays, they have a fun piece of jewelry to remember what is sure to be one of their favorite gifts. As it dissolves in the tub, a surprise high quality necklace with an emoji charm will be revealed inside. Great for christmas, Easter, or any other Holiday. Surprise emoji necklace inside - Truly a gift within a gift! As the bath bomb fizzes out, a high quality Emoji necklace is revealed. Luxurious bubble bath - Our original propriety formula one-ups traditional bath bombs by also creating a bubble bath. Colorful scented water - A fun bath experience with a Lemon Sugar-scented pink water! Emoji BUBBLE Bath Bomb with Surprise Emoticon Necklace Inside by Two Sisters Spa, Best Girls Birthday Gift Idea, Large Scented Spa Fizzy, Fun Color, Lush Scent, Kid Safe, Vegan, Hand-made in USA - It is pink and yellow swirled with pink sprinkles on top and smells like sweet lemon sugar. All of our bath bombs will leave your skin super-soft, and their scents will linger on your skin and in your room long after your bath. Skin-nourishing - Packed with olive oil to leave you skin super-soft! This emoji surprise Bath Bomb is the perfect gift for the bath lover in your life. Great for christmas, easter, Halloween, Valentine's Day, or any other Holiday. Our surprise bubble bath bombs are a gift within a gift - when the bath bomb fizzes out, Halloween, Valentine's Day, they have a fun piece of jewelry to remember what is sure to be one of their favorite gifts. Ingredients: sodium bicarbonate, Epsom salts, citric acid, witch hazel, water-based colorant, fragrance oils, olive oil, and colored sugar. Two Sisters Spa - Great for christmas, Easter, Birthdays, or any other Holiday. The best bath experience for superhero fans! when placed in the tub, our superhero bath bomb will fizz, and create a berry-scented, bubble, blue bath experience. Skin-nourishing - Packed with olive oil to leave you skin super-soft! Great for christmas, Easter, or any other Holiday. Narwhal BUBBLE Bath Bomb with Surprise Necklace Inside for Girls, Best Birthday Gift Idea, Large Scented Spa Fizzy, Fun Color, Lush Scent, Natural, Kid Safe, Vegan, Oils for Dry Skin, Hand-made in USA - As it dissolves in the tub, a surprise Superhero Minifigure will be revealed inside. The best surprises: each superhero bath bomb has a surprise Superhero Minifigure inside - Spiderman, Superman, Batman, Thor, Captain America, or Hulk. Collect all 6! Perfect gift idea: the gift that keeps on giving - they'll remember this special gift every time they play with their minifigures. Surprise kitty necklace inside - truly a gift within a gift! As the bath bomb fizzes out, a surprise kids kitty necklace is revealed. Skin-nourishing - Packed with olive oil to leave you skin super-soft! Skin-nourishing - Packed with olive oil to leave you skin super-soft! Two Sisters Spa - Great for christmas, halloween, Easter, Valentine's Day, or any other Holiday. Surprise narwhal necklace inside - truly a gift within a gift! As the bath bomb fizzes out, a surprise necklace with a narwhal charm is revealed. Perfect gift - need a gift for a child or teen who "has everything?" we've got you covered. Our surprise bubble bath bombs are a gift within a gift - when the bath bomb fizzes out, Birthdays, Easter, they have a fun piece of jewelry to remember what is sure to be one of their favorite gifts. Surprise necklace inside - truly a gift within a gift! As the bath bomb fizzes out, a surprise necklace is revealed inside. Puppy BUBBLE Bath Bomb with Surprise Girls Dog Necklace Inside by Two Sisters Spa, Best Birthday Gift Idea, Large Scented Spa Fizzy, Fun Color, Lush Scent, Natural, Kid Safe, Vegan, Hand-made in USA - Luxurious bubble bath - Our propriety formula one-ups traditional bath bombs by also creating a bubble bath. Colorful scented water - A fun bath experience with Cake-scented pink water! Great for christmas, Birthdays, Easter, or any other Holiday. The best bath experience for superhero fans! when placed in the tub, and create a berry-scented, bubble, our superhero bath bomb will fizz, blue bath experience. As it dissolves in the tub, a surprise Superhero Minifigure will be revealed inside. The best surprises: each superhero bath bomb has a surprise Superhero Minifigure inside - Spiderman, Thor, Captain America, Superman, Batman, or Hulk. Collect all 6! Perfect gift idea: the gift that keeps on giving - they'll remember this special gift every time they play with their minifigures. The Island Bath & Body - Our bath bombs are rich in moisturizing and soothing ingredients! As it dissolves in the tub, a surprise Superhero Minifigure will be revealed inside. The best surprises: each superhero bath bomb has a surprise Superhero Minifigure inside - Spiderman, Batman, Thor, Captain America, Superman, or Hulk. Collect all 6! Perfect gift idea: the gift that keeps on giving - they'll remember this special gift every time they play with their minifigures. Great for christmas, halloween, Valentine's Day, Easter, or any other Holiday. Surprise narwhal necklace inside - truly a gift within a gift! As the bath bomb fizzes out, a surprise necklace with a narwhal charm is revealed. UNICORN SPARKLE Surprise Jewelry Bath Bomb - Made in the USA - The Island Bath & Body – Shea & Cocoa Butter - Skin-nourishing - Packed with olive oil to leave you skin super-soft! Our surprise bubble bath bombs are a gift within a gift - when the bath bomb fizzes out, Valentine's Day, Halloween, they have a fun piece of jewelry to remember what is sure to be one of their favorite gifts. Our surprise bubble bath bombs are a gift within a gift - when the bath bomb fizzes out, Easter, they have a fun piece of jewelry to remember what is sure to be one of their favorite gifts. Ingredients: sodium bicarbonate baking soda, color, theobroma cacao seed butter Cocoa Butter, Cosmetic Glitter, Water, Butyospermum Parkii Shea Butter, Sucrose Sugar, Oleaceae Olive Oil, Sucrose, Fragrance Phthalate-Free, Citric Acid, Vitamin E.4 oz sparkling unicorn horn bath bomb scented in our best selling Tropical Vanilla! Tons of coconut mixed into a creamy rich vanilla! Very tropical. Two Sisters Spa - Skin-nourishing - Packed with olive oil to leave you skin super-soft! Awesome gift idea: the gift that keeps on giving - need a gift for a child or teen who "has everything?" we've got you covered. Our surprise bubble bath bombs are a gift within a gift - when the bath bomb fizzes out, Valentine's Day, Birthdays, Halloween, they have a fun piece of jewelry to remember what is sure to be one of their favorite gifts. Our surprise bubble bath bombs are a gift within a gift - when the bath bomb fizzes out, Birthdays, they have a fun piece of jewelry to remember what is sure to be one of their favorite gifts. Skin-nourishing - Packed with olive oil to leave you skin super-soft! Surprise kitty necklace inside - truly a gift within a gift! As the bath bomb fizzes out, a surprise kids kitty necklace is revealed. 4 oz sparkling unicorn horn bath bomb scented in our best selling Tropical Vanilla! Tons of coconut mixed into a creamy rich vanilla! Very tropical. Skin-nourishing - Packed with olive oil to leave you skin super-soft! When placed in the tub, the bath bomb will fizz and create a cotton-candy-scented, bubbly ocean-blue bath experience. Pirate BUBBLE Bath Bomb with Surprise Toy Mini-figure Inside by Two Sisters Spa, Best Boys Gift Idea, Large Scented Spa Fizzy, Fun Color, Lush Scent, Kid Safe, Vegan, for Dry Skin, Hand-made in USA - It is has blue swirls of color and smells like our kid-friendly Cotton Candy scent. Our surprise bubble bath bombs are a gift within a gift - when the bath bomb fizzes out, Halloween, Valentine's Day, they have a fun piece of jewelry to remember what is sure to be one of their favorite gifts. Our surprise bubble bath bombs are a gift within a gift - when the bath bomb fizzes out, Birthdays, Easter, they have a fun piece of jewelry to remember what is sure to be one of their favorite gifts. Markwins Beauty Products 80793 - Unique animal character packaging. As it dissolves in the tub, a surprise Superhero Minifigure will be revealed inside. The best surprises: each superhero bath bomb has a surprise Superhero Minifigure inside - Spiderman, Superman, Captain America, Batman, Thor, or Hulk. Collect all 6! Perfect gift idea: the gift that keeps on giving - they'll remember this special gift every time they play with their minifigures. Lip smacker lip Balm, Unicorn Magic, 014 ounce surprise unicorn necklace inside - Truly a gift within a gift! As the bath bomb fizzes out, a surprise rainbow unicorn necklace is revealed inside. Luxurious bubble bath - Our original propriety formula one-ups traditional bath bombs by also creating a bubble bath. Lip Smacker Lip Balm, Unicorn Magic, 0.14 Ounce - Colorful scented water - A fun bath experience with Grape-scented purple water! Great for christmas, Easter, or any other Holiday. Surprise emoji necklace inside - Truly a gift within a gift! As the bath bomb fizzes out, a high quality Emoji necklace is revealed. Luxurious bubble bath - Our original propriety formula one-ups traditional bath bombs by also creating a bubble bath. Colorful scented water - A fun bath experience with a Lemon Sugar-scented pink water! Skin-nourishing - Packed with olive oil to leave you skin super-soft! Minifigures vary by bath bomb - Collect all 6!